Well as we are now at the last day of 2011 I am excited for the 2012 weddings already booked with me and those I know that will come along as the year progresses. 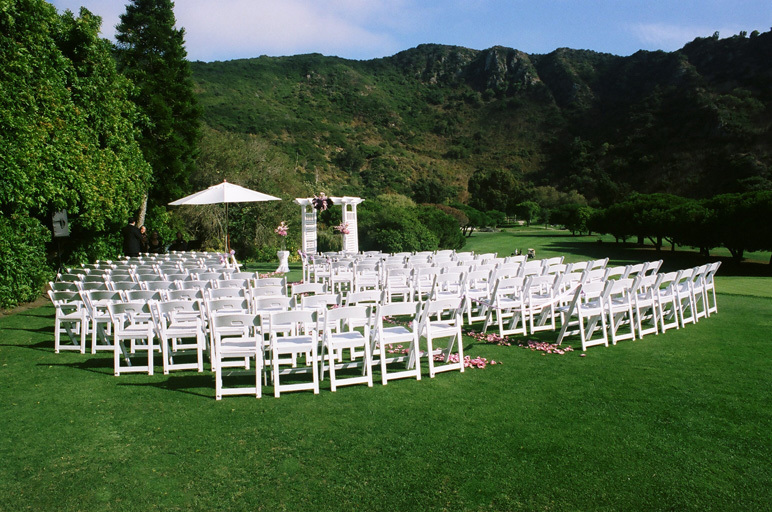 New to me will be the Flying Caballos Guest Ranch in San Luis Obispo and Parker Ranch/Trabuco Canyon, it will be nice to be back at the Biltmore LA, Laguna Cliffs Marriott, and of course at The Ritz-Carlton-Dana Point/StRegis/Hyatt HB (our normal haunts), and seem to have a few more church ceremonies with hotel receptions than previous years, and it’s nice to be getting calls from brides considering Ojai or San Diego locations that would like to work with me. So as we end 2011, to my couples whose weddings happened this year, thank you. I take a bit of each of you and our experience together and your wedding celebration with me into my future, and for the couples I will work with in 2012 I can’t wait. 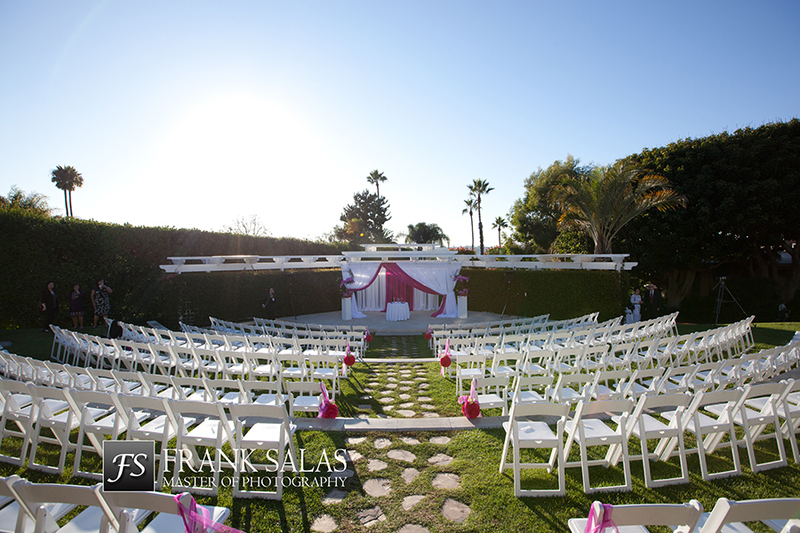 Thanks www.tonyflorez.com for the photo above, florals were by the fabulous Square Root, both vendors always fab to work with & have on the team. The above pics were courtesy of the dj/Steve Shanahan using his Iphone. 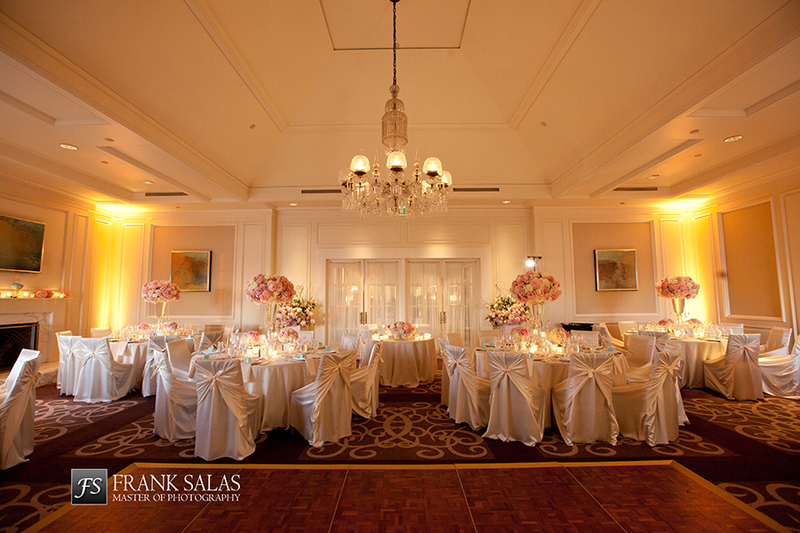 I can’t say I have ever seen a photographer do a pano of this room like this, so dark, but love it. The brides inspiration for this look was a photo on my office wall from a previous wedding, she loved the airy feel of the tall calla lillies. 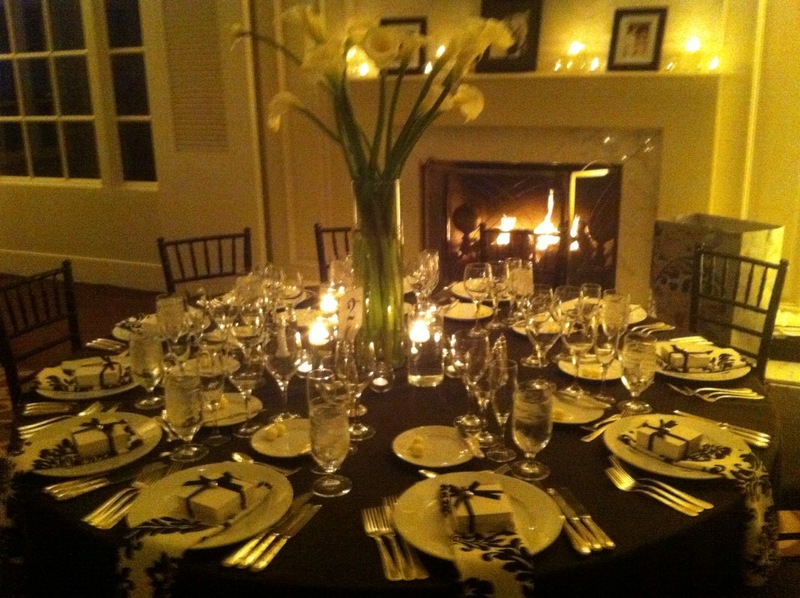 We used the hotels black linens and brought in black chivaris which looked so elegant and then gave a pop by doing the fabulous black & white pattern napkin, lots of candles together with the fireplace being on, voila, a fabulous look. Then look below, same room but earlier in the day, so you can really see the detail, these photos courtesy of my lovely bride, and guess what, she never got any photos by her photographer inside the room with the fireplace on/that atmosphere before people came in, so I was able to forward her over the djs pics so she had those to enjoy/remember how fab it looked. What a soft fresh feel/look, the photo above, courtesy of www.jamesjohnsonphotography.com, was a daytime wedding, and when you walked in it just looked pretty, soft, fresh, and made you smile. Exactly a reflection of how this bride was and how she made everyone feel around her. For the above wedding (pic courtesy of wonderful www.tonyflorez.com) the bride went with a really nice rich red linen with black runners and napkins, some tall centerpieces and some low. Very dramatic when you walked in. A great reflection of them, comfortable and warm. 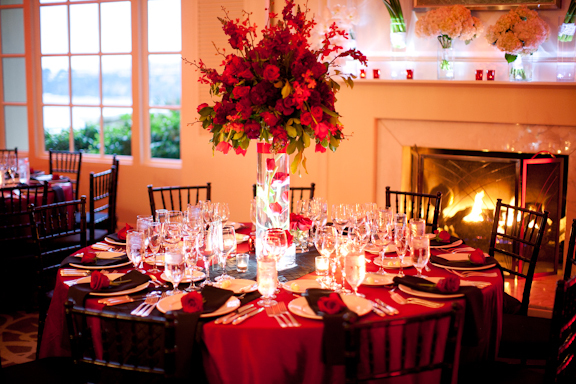 We used a red uplight in each corner, when you have a strong color in the room you can do that to add a pop/further enhance, but in a smaller room you want to be careful it’s not too much. 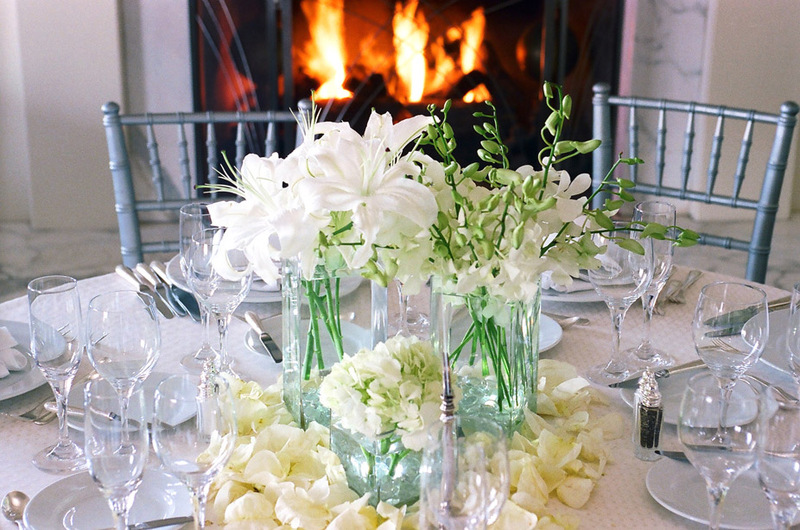 We use amber a lot to continue the warmth/feel from the fireplace and candles, otherwise the bride’s ‘color’ if she wants that to be enforced. During dinner just outside the room in the foyer, we setup the EPOD photo booth (it talks to the guests and it’s words match the guests, when they are sober it’s nice and normal, the more tipsy they get and funny/amorous, the more the words comment on what they are doing, it’s hilarious. 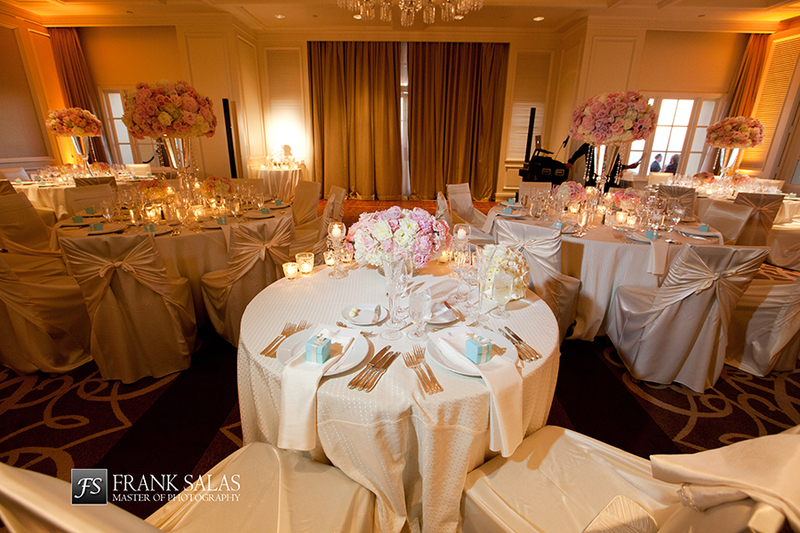 My bride for the above wedding wanted her color/theme to be Tiffany Blue but she was a lovely elegant woman and I knew we had to watch how much we used the color and where. 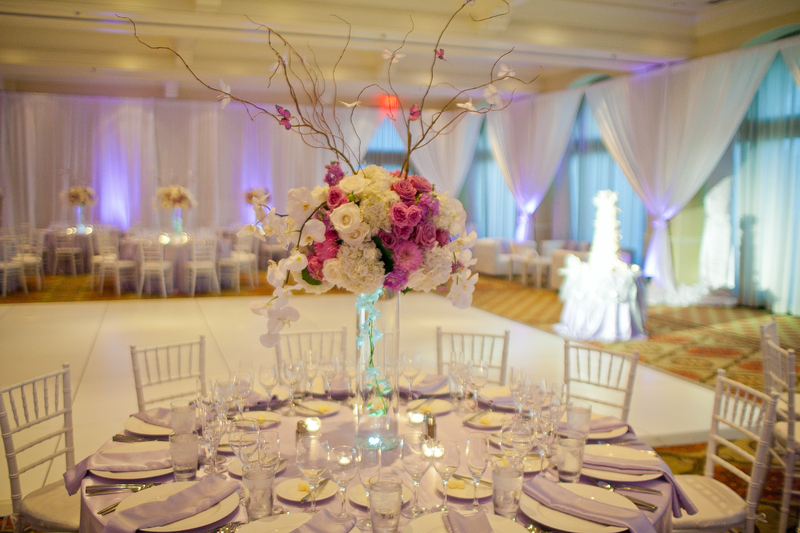 It’s a hard color for flowers so we stuck with champagnes/ivory/blushes which is a very romantic palette, Instead of chivaris we covered the hotels chairs which gave a rich/romantic feel along with crystals and candles. It was a warm/loving feel in the Plaza which was a total reflection of the couple and not only how they felt about each other, but also the intimate group that had been invited/had come from afar to celebrate with them. 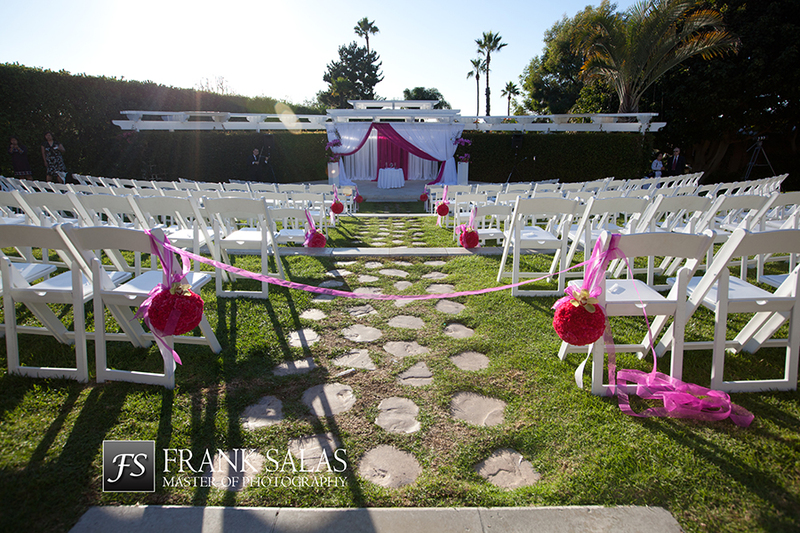 Thanks to www.franksalas.com for the pics and always being just a pleasure to work with, we love him, plus of course, Nisies Enchanted Florist for the beautiful signature look of her florals/style (I knew from the moment my bride and I started talking and working on budget, we must have Nisie). Cere/cocktail music by my fave string group Naples, and dinner/dancing by fab Jeff Holmes/Moondance. Hair/makeup by Design Visage, and a dove release by wonderful Pam with White Flite, always a successful timely release that has everyone wowed. For the favors we went to Luisa Chocolatiere based in Laguna Hills, she got the boxes from Italy and inside had made 2 swans (the brides favorite icon for the wedding, because swans mate for life!! ), one was dark chocolate with raspberry filling-the brides fave, and for the groom – got to love it – milk chocolate with tequila inside and sea salt on the outside, yum. I had to do the final taste test due to B&G being in Texas, and it was a chore, but I okayed the end result!!! LOL. Inside the box was a note saying whose chocolate was whose fave and the description. Nicely done as always Luisa. My couple from above came with all their guests from Sacramento to celebrate. A nice change to see a bold color in this room this year. Thanks to Katie Clark for the above pics, and always being fun to work with. Alicia booked me for Month of service, but used my preferred vendor list in her planning and my advise during her planning months (two) and ended up with a great team and didn’t spend a fortune, but made it look/feel like she did. The above wedding (thanks for the pics Nancy/bride) was so soft and pretty, no wonder it was published on Style me Pretty. 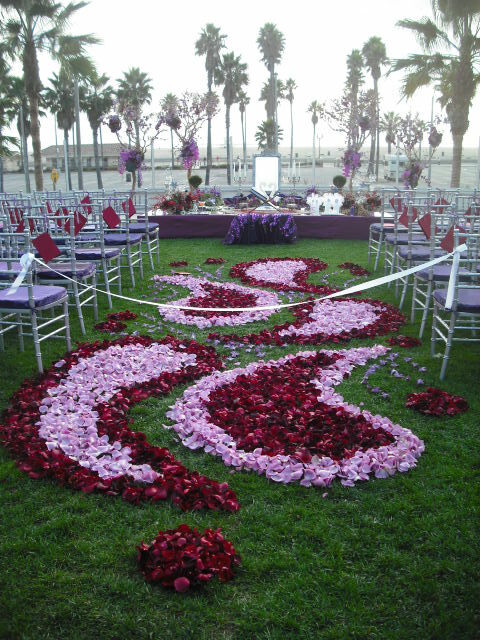 The end result was well worth the pain we went through to get the florals right on the day. 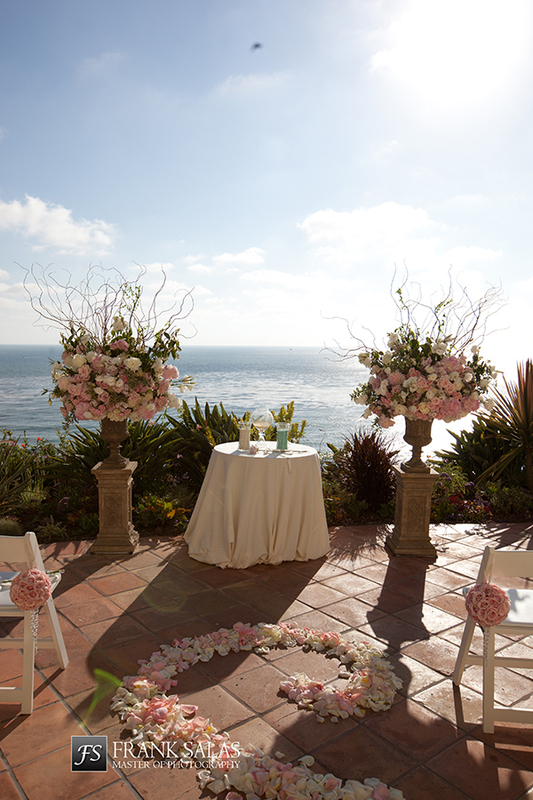 6 tables, 3 different style of centerpieces and the ceremony was angled giving a straight aisle, rather than the flat to the ocean positioning most couples choose for this site. All these tweaks made this wedding theirs. The wonderful Peter Papadopolous/Vive Ent, was our dj and mcee and as always a pleasure. 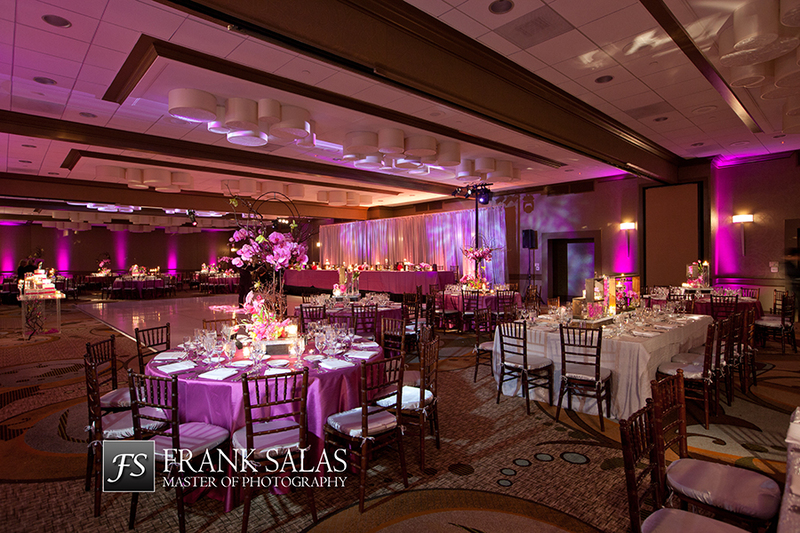 These weren’t all the weddings we did in the Plaza, but gives you a good feel for how that room works no matter what your colors/feel/theme, as this is a nice variation of looks/styles/florals/colors for you to see. Hi Lisa. Just want to thank you for working so hard to provide the most wonderful wedding for Lisa and Scott. It was so beautiful and you guided us to making all the right decisions with so little effort on our part. We really were able to enjoy the celebration and be present knowing we were in your capable hands. We can’t thank you enough for making our evening such a lovely memory. Please reference me if anyone would like to know about your work, I would be more than happy to tell how amazing you area. Until next time. Regards Rhonda. What is really nice is how many of my notes/cards said they would be happy to ‘vouch’ for me. Touches my heart, thank you. I already have notes from next years brides, but wanted to share the ‘after thoughts’ from the 2011 brides that put words to paper (some called and chatted afterwards, but that is very hard to quote/write about). All these written ones are available to be read/seen in my office, as well as last years and the years before, going all the way back to when I started doing weddings in the early 90s! I hope you enjoyed reading these as much as I enjoyed the reminising I was doing as I was re-reading and then typing them out. I am sooo lucky. 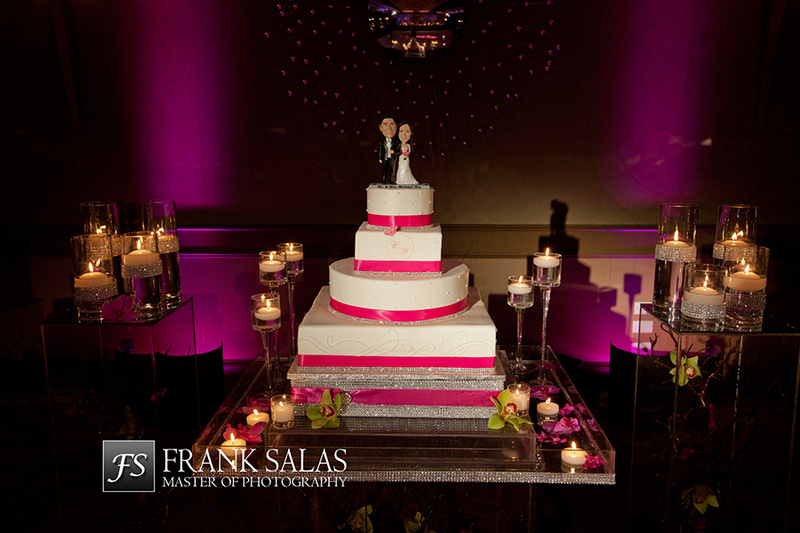 Well the above pic gives you the hint that the bride & groom for this wedding wanted something a bit bold and different. From the beginning this couple had a feel/vision for their event and they spent many hours meeting with florists, djs etc, to ensure their end result was achieved by the right team. The ‘normal’ florally wedding was not for them. 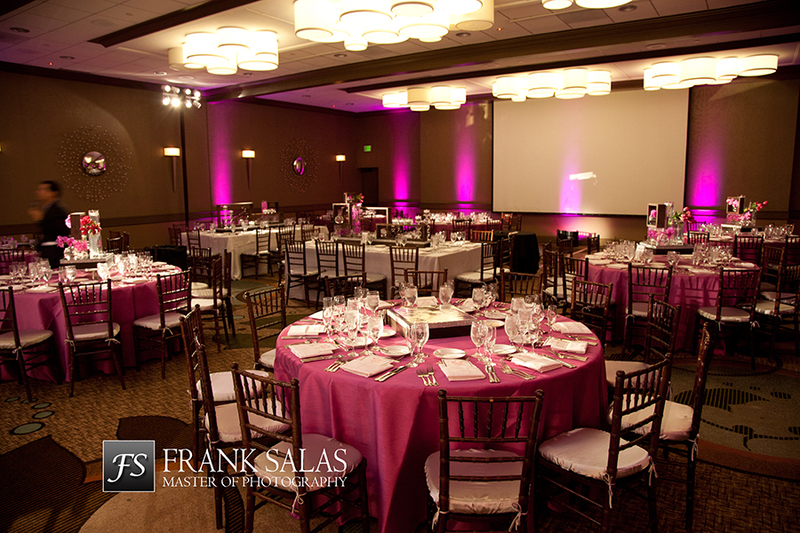 You will see that the pop of color was fuschia which stood out at the cere site, and in the ballroom it added a softness to decor that could have come across as very unwedding like/harsh/bold, as thecenterpieces were actually more wood and structured with candles incorporated, florals were minimal. There are not too many florists that feel comfortable with this look but Shawna Yamamoto is and she pulled it off beautifully. This is a design look where the monies are mostly in the artistic/organic design aspect not for the florals. There were three different style centerpieces mixed in amongst square and round tables, with this look some of the centerpieces did stop you from talking to/looking at someone on the opposite side of the table from you, but it really wasn’t a negative, whereas with a ‘normal’ floral look it would be. 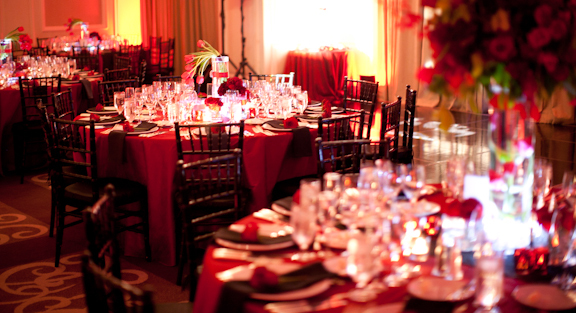 Of course fruitwood chivaris were perfect for this from Fusion Linens & the draping behind the headtable. 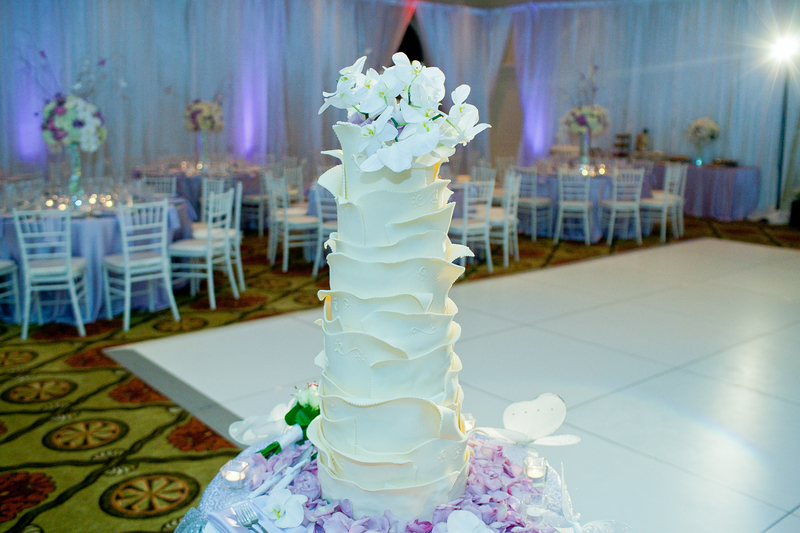 We were in the Plaza Ballroom & Arbor area for the reception/dinner/dance, the room size was perfect for the number of guests we had and one side of the room was the entertainment side with a crepe station, magnet station, specialty coffee & dessert station. Loe the Arbor area where cocktails were held and throughout the night there was always a small group out there enjoying the atmosphere. I worked with the team from Impressive Video for the first time, nice group of guys and they did a same day edit which is always fun (stressful for the videographer) but always nice to see the looks of suprise from the guests when they realise they are seeing something that happened a few hours ago. Tim the violin/dj from Invisible Touch was the perfect guy for this wedding also, bit different/fabulous different, such a nice guy and easy to work with. We had Tim play the violin along with recorded tracks for the cere & cocktails, and then a bit at dinner, but the dancing was full on party music. Eddie from the Hyatt was not who we started with at the hotel, but was who we ended with and he was a pleasure/joy. He is really going to be an asset to that hotel in the growth of their wedding business and getting their name out there. He came mid season to the hotel and I ended up doing a few weddings with him and just love working with him and look forward to many more, as well as seeing him out and about at industry events as he is keen to come on out and see what is going on out there, which is a bonus for that hotel and the couples he will be working with in the future. This is a tough topic. How does someone gain experience if they are not referred, we all had to start somewhere (mine was 13 years in hotels planning weddings from that side and realising what was missing from the bride’s side/protection-big picture perspective), but my chat below really is about using tried and true vendors. This is your wedding, you are spending more money in these 5-7 hours of your life than you ever will again for something you don’t live or drive in, or for that amount of time, and think about it, you are spending that money on/for others predominately, not just you. So why does a hotel make you hire a co-ordinator? Because this person is now working on your behalf to ensure everything you should have done/be prepared for has been done/thought of. A person provided by the hotel is not going to do that, they may ask questions that make you feel like they are interested or assisting, but their responsibility is solely to the items that you are paying them to provide/do for you. I know this, having trained ladies to be my day of co-ordinators when the hotel I worked at would have multiple weddings a day and I could not co-ordinate them myself. I trained the ladies, to ensure that everything we could be blamed for that was our responsibility was done correctly, anything else, was the client’s vendors fault or the couples fault for not thinking it thru/planning it out, whatever they had been responsible for. So be happy when your location wants you to have an unbiased person involved, or even if it has to be someone off their list, they are on the list because many couples before you were happy with them and their event, so why mess with that. If there were a lot of problems, that person would be off. The hotel person who gives you a list or makes a suggestion as to a local co-ordinator/s for you to call, has already in her mind worked out who would be a good fit for you or be the kind of co-ordinator you would enjoy/trust/work well with. So don’t think there is some underlying devious thought process going on, you are truely being pointed in a direction that the hotel person believes is going to end in a positive end result for all. Same goes with a co-ordinator, I don’t refer anyone I have not worked with (or someone I know in this biz suggests if I don’t have someone we need). Many reasons for this, I don’t know how they work, are they slow, are they reliable, is the end result what they promise in the sales, are they easy to communicate/work with, do they come and do their job without causing turmoil for the hotel staff or me/my team. The vendors I refer have insurance (so important, this year I had a few couples who had found vendors thru internet or their local shopping area and decided due to pricing or style, this was the person for them, then I find out that vendor does not have liability insurance. Seems strange to me a business person not having liability insurance but guess if they have gambled and been ok for so long they don’t see the point if something did happen to one of your guests and it was this vendors fault, due to no insurance, be prepared your guest if they can not longer work, is going to sue you, they need income/way to pay medical bills etc, they will go after anyone they feel can assist with their dilemma), but thank goodness the 5 star properties here in the OC demand they have liability insurance, but some of these vendors don’t know that, and suddenly you have a vendor you have given a deposit to and they don’t have insurance. For one wedding that booked me very short term, the groom paid for 5 vendors day of insurance, and for another wedding they paid 1/2 the cost for the photographers insurance. I have to say for the first groom, his end result in product was fine, but did he end up spending more than he saved ultimately by choosing those vendors and then paying that insurance, I don’t know. In the latter, unfortunately they got what they paid for, a photographer that was not good, did not get good pictures and was very slow. Very nice, but his being nice, is not what you are going to be looking at in an album you don’t like in 5 years time. So, the vendors I refer all have the insurance, are all seasoned/experienced. For the photographers, they are quick, they know what to shoot, where and seem to always be in the spot when it is needed. They all started in film, so never need to look at their digital screen and see/hope they got a good one with the 8 clicks they just took. The rental companies I use will include the delivery/setup and same night pickup fees, there are too many companies out there sucking brides in with low pricing, then the bride finds out closer to the event that these fees need to be added on, not a nice suprise, or worse she doesn’t have the money now so she/the family/the bridal party must tear down the wedding. The djs have the latest equipment and take up little space and are quick at moving equipment from one area to another, you never hear feedback, they look good, and believe it or not can pronounce words that can be heard and understood, I saw quite a few bad mcees this year, this person makes or break the level of event you are having your guests experience. Florists and hair/makeup, they can do what you need, and it holds up!! Here’s the biggie, if they have been around for the past 5-20 years, chances are good they will be around in the next year or more. So many of the vendors you are finding on line, seem to specialise in the latest look, date themselves/their work really quickly and don’t last because their style did not last, or they realised that being in the wedding business is a lot of work, not a get rich quick op. You want someone whose passion is there from the time you booked them through to your wedding date and after, not someone who gives up the career at some point after the sale and you are their last wedding. I have had dinner at the vendor table with these folks, so tired and so happy that this is their last. Do I believe they are putting their best foot out there to ensure you get the best of them, no, why, they aren’t relying on the end result of your wedding to give them more business. You also don’t want someone who needed to quickly make money, made a web site, started taking in deposits, then got an offer of a great job, and suddenly disappeared, or worse still and this has happened, a photographer who has so little business they are using money you paid them to pay their bills and now can’t fulfil your order/album, there is not enough future bookings coming in to cover past fulfillments. I offer vendors that have different styles, come from different area codes locally for convenience, and start at different budgets. Just because I or a hotel offer them, does not mean they are expensive, sometimes they are inexpensive and you would never find them on your own, thru referrals they are kept busy and don’t need to social network/advertise etc. If we bring them enough business makes sense why should they put in more effort to get more business unless they want to grown, right. When we do your budget I start to work out who I think $$ wise is right for you and then match the vendor that seems to also have the style you are looking for. You always get more than one to choose from to start, if that’s not working you can tell me why then I seek out past the inner circle, there are sooooo many vendors out there your co-ordinator knows/has worked with and sometimes when we have to extend past the norm, it reminds you of someone you have forgotton about. Now in saying all this, trust the hotel in believing you need an outside co-ordinator and trust if they are directing you to certain people. Trust your co-ordinator with the vendors she is suggesting you look at (unless she is getting a kickback and this does happen feel free to ask) these truely are people she thinks are going to give/offer the best for you for your day/event. Pictures can be taken off peoples websites and put on their new site/the up and comer that wants to look great. I had a florist whose friend was a starter co-ordinator, the co-ordinator was assisting the florist with a wedding I was doing at the Ritz, I worked out something was up when this person was asking the staff more non floral related questions than working on the flowers, and I am sure that after that wedding she posted photos on her new website saying something along the lines of, such and such got married at the Ritz, florals by ……., it was a beautiful day, everything went smoothly. Now as a reader of that website, you have no idea that she had nothing to do with anything, and she hasn’t said anything that was not true. But you are not getting someone with experience and possibly they are a bit devious in their work ethic/way to get ahead, which would make me wonder if this is someone I want to trust all my money and dreams to. So be careful, you want to see a good track record, you want to see lots of weddings, that tells you the person you are looking at is constantly working and obviously making people happy. Sometimes there is the unhappy client, but my years in this biz have taught me that generally there is something else wrong and they need to find something to blame for their unhappiness or situation, except the reality. Your key is the hotel, ask them about the person are they right for you, asking a past bride doesn’t really tell you anything, of course they were happy otherwise they wouldn’t say they could be used as a reference. I am always suprised when I get asked about a vendor I have referred, ‘but are they good?’. Of course they are good, why would I recommend someone that wasn’t, it’s only going to come back and bite me. If who I am suggesting is not working for you, then we keep looking until we find the right person, and sometimes my couples find the right person themselves (friend and family recommendations are a great way, tried and true also), and I have then ended up with a new vendor that I now recommend, but all too often, my assistants on the day after shadowing a photographer will come back and mention how slow they were and they didn’t seem to be taking good shots with great backdrops or seem organised/professionals. I notice the mceeing and the rental companies and compare, and generally these decisions are financial, but I will tell you, with all of these, you get what you pay for in the end. Doesn’t mean to say from your guests perspective anything could be seen to be wrong, but if you have ended up with stress due to that vendor/suprise fees/time and effort, then you probably did not save anything in the end. Not a fun topic, again, hard for newbies to get experience if everyone is using who/what they know to ensure a great result, but that’s called insurance. Having someone co-ordinate your wedding who lost their office job and then took a course at a night school but has no practical long term hotel/catering experience is not going to be a good co-ordinator, she/he is not fully rounded and the hotel or someone else is picking up their slack to ensure a great end result. Someone creating a website with their wedding photos and saying they had so much fun planning their wedding and now are co-ordinating, again, even if charging very little, are you sure you want to risk them planning yours? They don’t have the connections/relationships that are very much part of this business, as it is with all business’. And most of the time those relationships benefit you, the couple getting married. Thank to www.tonyflorez.com for the above pics. When Ramona and Doug and I started planning their wedding they lived here, then Doug got a promotion to Boston, he went first and Ramona followed and all the while we were getting things done. Then he got transferred back about a month before the wedding. It was a great, loving celebration with a lot of family celebrating with them. For this one I matched Victor from Invisible Touch djs to them for their event, and he was perfect, he had to keep up with the different requests and styles of music being asked for, he was a trooper. Please look below. Isn’t this a beautiful look. This was a Persian/Iranian cere I did at the CA Courtyard. Picture courtesy of Elegant Sofrehs by Taraneh. We have done a few weddings together in the past few months. The wedding below, photos courtesy of Katie Clark photographer (love her), was just a labor of love for me. ‘My double A s’ I called the bride & groom, Alexander/groom meet Alexandra/bride!! Too fun. Something happened on this one when we were interviewing photographers that made me stop and really live in that moment, we had met with Katie re photography, she was the first we met with and we had 2 more appts following hers, Alex the groom normally has quite a bit to say (but not in an obnoxious way) but he was quite quiet during the meeting. When we left he said to me ‘she is it, she is our photographer we don’t need to meet with anyone else’. I said to him wow, what makes you so sure and his response to me was ‘I can’t explain it, but her work spoke to me’. I think that is the greatest compliment any photographer would like to hear someone say about their work/passion, this person ‘got’ them and their style or what their eye saw. Fabulous. Well I did make the three of us go to the next meeting, who happened to be a fabulous photographer and I just needed to be sure Alex knew what he wanted, and after that meeting he was still adament Katie was for them, so I cancelled the third meeting. The pics below are what I need for my blog/portfolio, but I know from the xmas card I just got, that they got the artsy look/feel from katie in their photos of them they were looking for, it was a beautiful xmas card. This was also a wedding where I was already booked for another wedding on their date, so they met with Peni and me at the initial meeting/interview and were aok moving forward, with me from budget through every aspect/detail of their event, vision to reality, moments, food/beverage choices, and then had Peni orchestrate the actual event on the day itself (per the detailed timeline/order of events we had all created together). The neat thing was, my wedding was at the Hyatt also, so I was able to pop over a couple of times and say hi and get/give hugs. Well I loved my time with the bride and groom from the wedding below, my bride was Italian and just sweet and pretty and kept me laughing. I had trouble pronouncing her name and at one of our first meetings told her I was renaming her and called her a new name and low and behold she liked it!! I was kidding. From that time on, each vendor we met and I would say her real name she would correct me and want them to call her the name I gave her. Cracked me up. One night we sat in the office while on her IPAD she showed me where they were going on their honeymoon and by using the google earth or whatever it was we were able to actually see the sand/clearness of the water and feel like we were there. So then we got suckered in and I took her via IPAD to my home in New Zealand, the street I grew up on, my parents houses, and then we ‘drove’ around my neighbourhood where I was suprised to see how many of my neighbours have pools in their yards!!! That was when it became scary and I decided maybe the internet/computer age has gone a bit far and privacy really is a thing of the past. Good for honest/usefeul/normal research, but that is where it should stay, right!! Anyway, she loved butterflies, so we incorporated them into everything but to where it was just right/not too much (no butterfly release tho, have yet to see a ‘good’ one, doves no problem), we had so much fun taking the words (I have all couples I am starting from the beginning with use words to describe what they want their guests to feel or what they want to feel when they see their event in pictures) and making them a reality. Thought we were done, and suddenly a week before the event the groom said to me, Lisa she really hates those drapes in that room what can we do, the only thing we can do is drape the room I said, so drape it we did. It looked fabulous, first time I have since the hotel opened seen anyone drape here, we do it further south a lot, just don’t seem to get the op here, so I was thrilled with the end result and so were they. Also this cake exceeded the amount alloted in the package, so they did have to pay more to get more tiers and the look she wanted, but it was worth it, it was a stunner. Thanks to www.tonyflorez.com for the photos, great working with Jeff Holmes/Moondance dj as always and linens/dancefloor/draping, chairs were all thru my good friends at Fusion Linens, never any suprise charges to get things done when they need to be done, and you will notice we also added some seating areas on each side of the cake table which were well utilized once the dancing began and people started moving around and chatting. 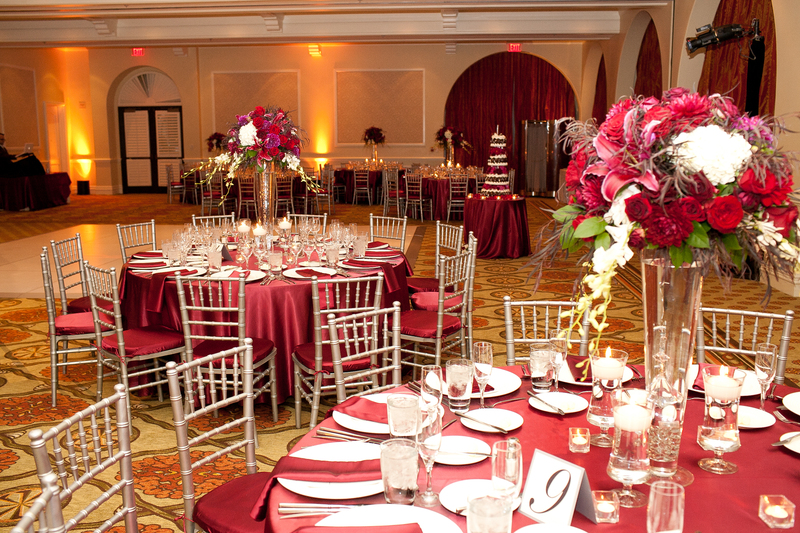 You will be noticing that I set this ballroom up a lot where the couples table and the cake are centered and most of the time my couples table is against the service wall looking towards the window – I really don’t see why you should be facing a wall but some of my couples want the windows behind them. 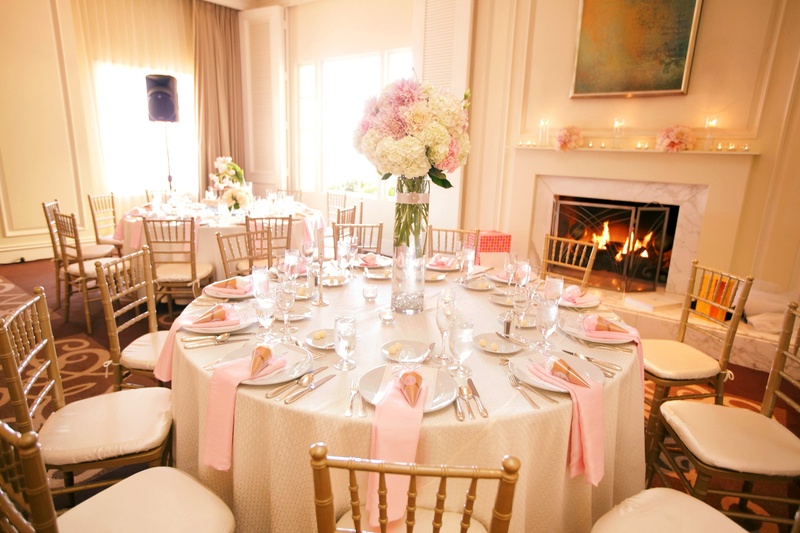 By setting the room this way, all guests are as close to you as each other, nothing is off to the side missed by some or seemingly not important. 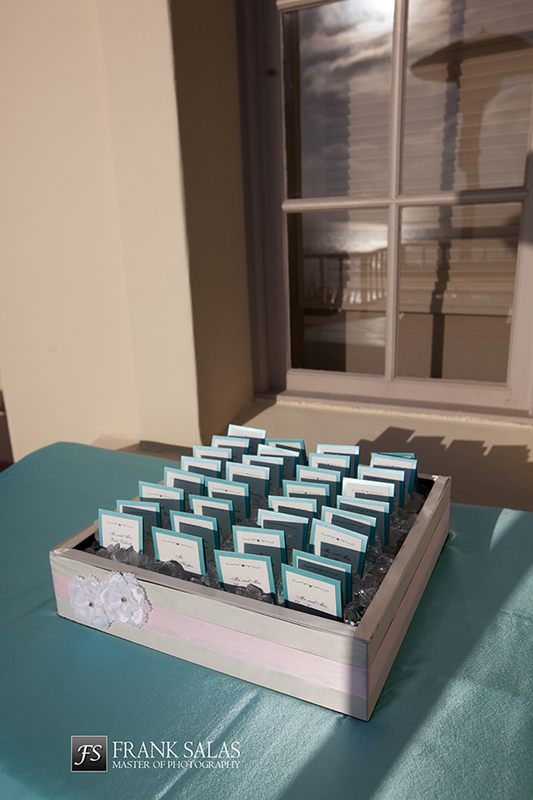 Also I had started doing it towards the end of last season for some weddings, but it seemed this year all the brides loved the flat hang fold napkin, very clean/elegant looking, so you will notice that is the fold used in the majority of the photos I am posting of some of my 2011 weddings. It’s these little things that each year can be different/make a difference. 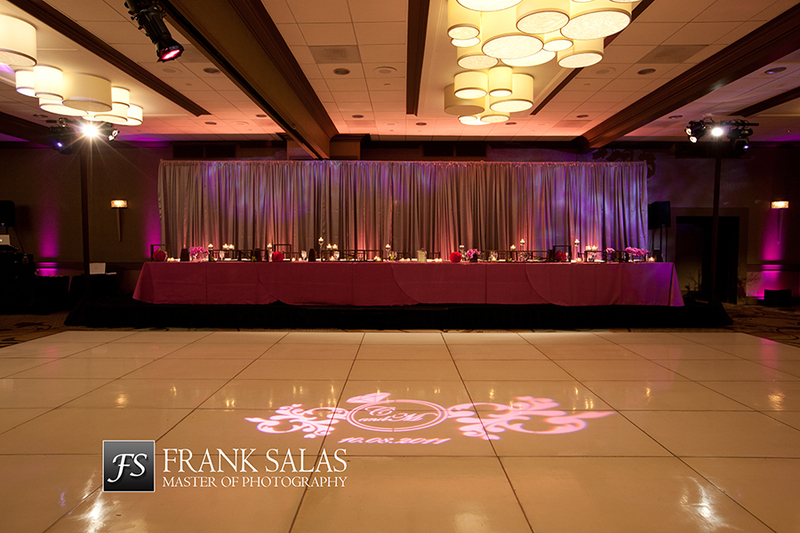 Above are just a sampling of the weddings we did in the Vista ballroom, there were quite a few more. 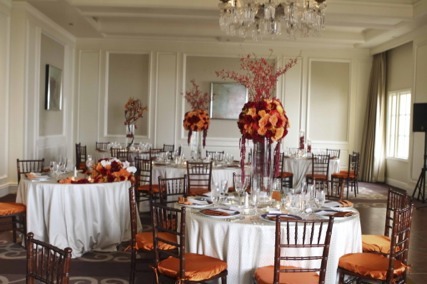 It seems a lot of the lunch time weddings tend to use the hotels standard linens/chairs and are a little lighter with florals/color, whereas all the weddings above were evening, so those weddings tend to want to create a complete environment. What you think the couples above spent and what they actually did spend, will suprise you. It’s all about us using the right vendors to match the couples style and budget and that is where I really get to have fun working out who that team should be and then guiding you along the way. Again, thanks to the wonderful team at the Hyatt HB who we love working with, from the team in the office, Cheryl, Jessica, Sarah, Mark and the wonderful assistants Jamie and Cathleen, all headed by Nancy, to the banquet team we work side by side with on the wedding day, headed by Glenn (who I have known for around 20 years, he is the banquet manager and very seasoned from a variety of properties in S CA and really leads the team by example), the great banquet captains as well as the banquet staff/servers and bartenders (headed by Javier who is excellent) some of who we have worked there with from day one when the hotel opened. Really really nice team, all there to ensure the success of your event, and of course Hyatt style, service and amenities, not to mention, the wonderful location of the hotel for visitors to S Ca but also locals that go to the beach but never wander across the street to the hotel that looks so nice!! Enjoy your day/time with whomever you are spending it with. Well you can’t be of use to your current couples, let alone future couples, if you have no idea what else is out there, or what seems to be the ‘in’ thing etc. So if I get an invite, I am there. Below is a smattering of some places I was invited to events at in 2011 that I normally don’t get to do weddings at, and any comments/thought I may have. Fairmont Newport Beach, a really nice yet I think forgotton property on MacArthur Blvd close to John Wayne Airport. 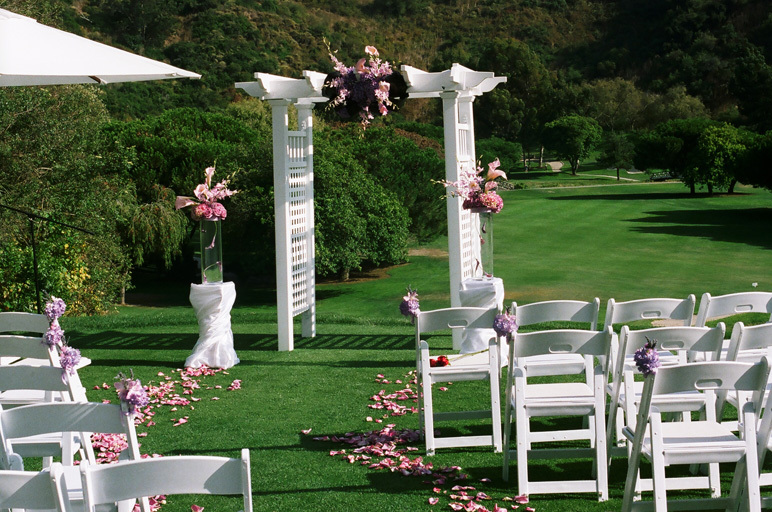 Dove Canyon Country Club, a really lovely area tucked up under the Saddleback Mountain. A couple of hotels about 10 mins down the toll road for your guests to stay at. 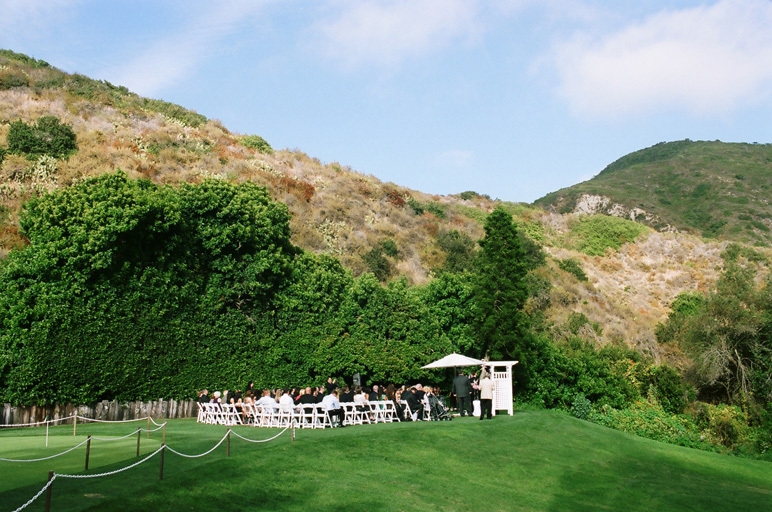 If a canyon/nature backdrop that comes with a feeling of elegance and specialness is what you are looking for, this could be the spot for you. The Waterfront Beach Resort – also in the past known as the Hilton Waterfront Beach Resort, still under the Hilton umbrella, just rebranding the name. Had a couple of events to go to here this year including just recently their first every xmas tree lighting which I was honored to be part of a very small group invited to. The girls who handle the weddings here, Vanessa and Danielle are a blast, love their jobs, brides, and having a good time. Bella Collina Golf Club – this is a pretty new facility that has got such a lovely italian feel to it, from the long driveway lined with the olive/cypress trees to the view from the ballroom/restaurant and the lovely ampitheatre area they have created for wedding ceremonies. But the big secret here is, just off the main parking lot is a lovely little organic farm called Villa Romano Green farms. They sell produce and everything is so fresh and good. 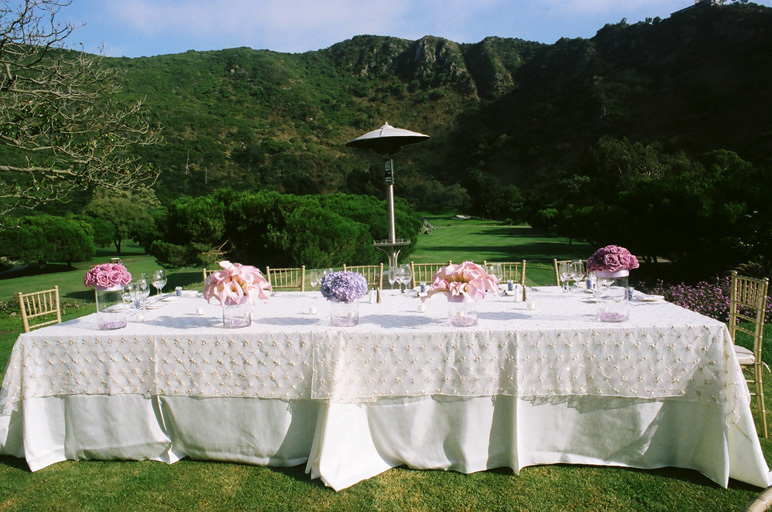 I happened to enjoy a dinner on the farms land where we were up above the golf club, sitting at vintage style tables and items that had been placed there for our dinner, with views to the ocean in the distance. We ate fresh beautiful vegetables and meats and drank some lovely wines provided by a couple of the chefs that buy their food from Farmer John. I see this for a never to be forgotton rehearsal dinner or a group of friends that enjoy good food, wine & views but can’t get to italy together, or a special birthday or dinner celebration. Really inspiring and memorable. Surf & Sand in Laguna – well this is a great hotel (had my 30th birthday on the top floor when it was a restaurant) with a pool area that looks right to the waves crashing/sand, has a lovely spa, great food in Splashes, and very popular for wedding celebrations, the only kicker here, is that the reception rooms don’t have ocean views, but the F&B minimums reflect that, so it evens out. 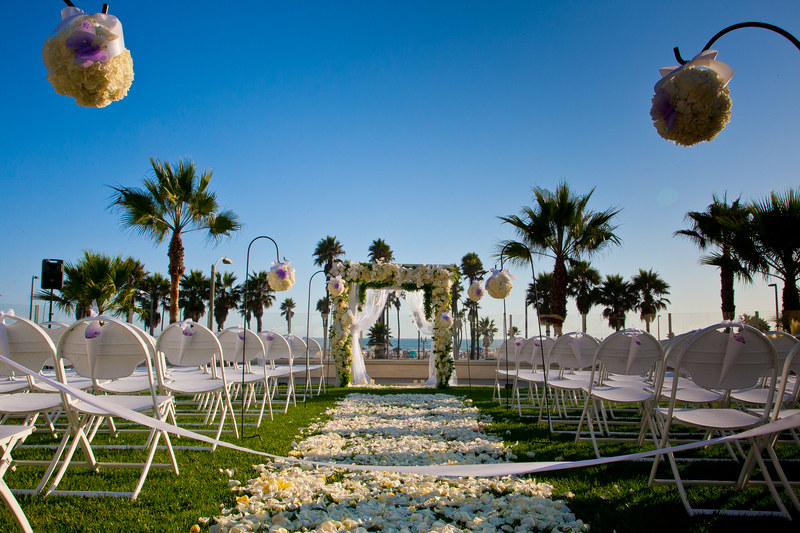 The Deck/Pacific Edge – I had done a wedding here at the end of 2010 and I had a feeling things were a foot, I was so right. You can still rent out the house/deck area for a private event, but it really is now set up as a great place for cocktails/food open air looking out to the ocean, cool hip bar & funriture all on the deck. Then the hotel rooms that connect to the ‘deck’ have been setup now so they can be rented out as loung rooms with cabanas outside or you rent the cabana for the day. Very unique use of space, but so makes sense and I can see locals even booking a cabana for the day, hanging out on the beach, eating from the Beach house restaurant (they will bring the food & drink to you all day long), nice and comfy and a lot less than owning land along the coast. For out of towners, if you are in town pre wedding, I see the girls hanging out in a cabana for a day/afternoon, there is a nice day spa just up the road you can utilise too or take the loungey room too and have a masseuse there all day to pamper you all. 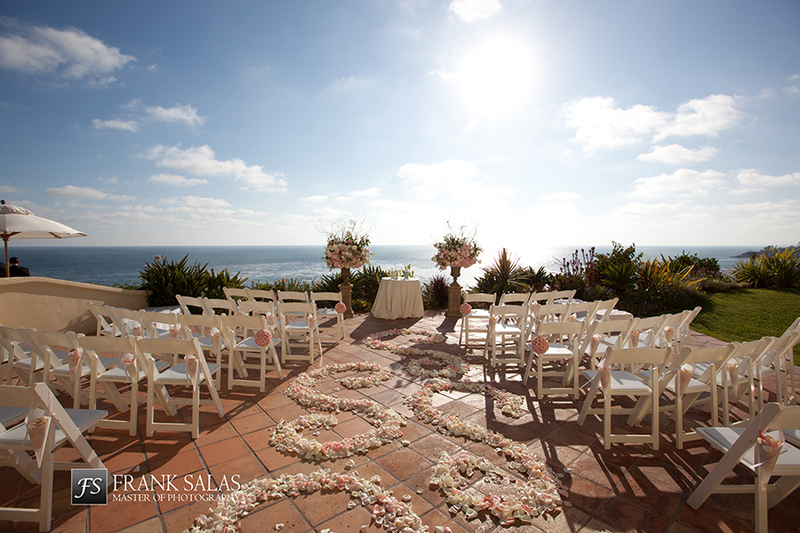 Casa Romantica, San Clemente, a view that is hard to beat looking out to the San Clemente pier. The Villa itself is different, you can make use of the inside or as most seem to, do the dinner/dancing in the courtyard area. 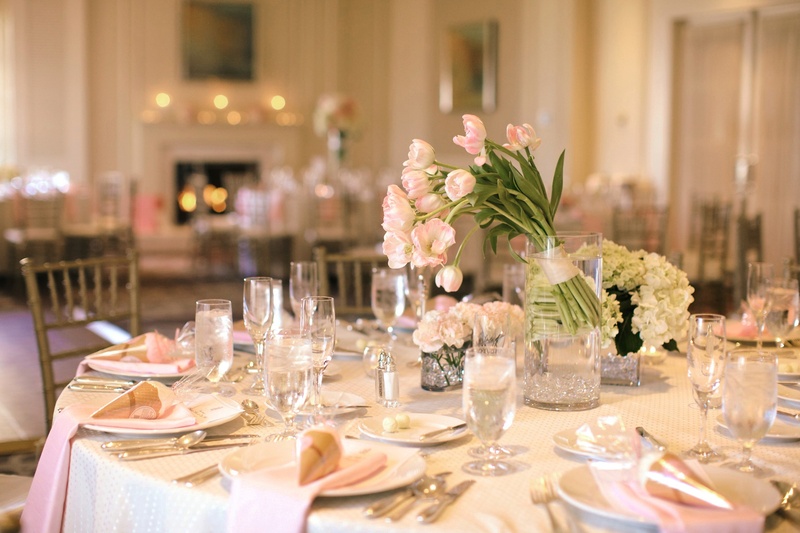 Think everything must be done by 10pm, and my only real thought here is, by the time you pay their site fee, get the caterer, rentals etc, I think you may be just under what it would cost to be at a five star like the Ritz Carlton, so then it really comes down to if this feel/look is more you and your guests and you are okay paying that much. 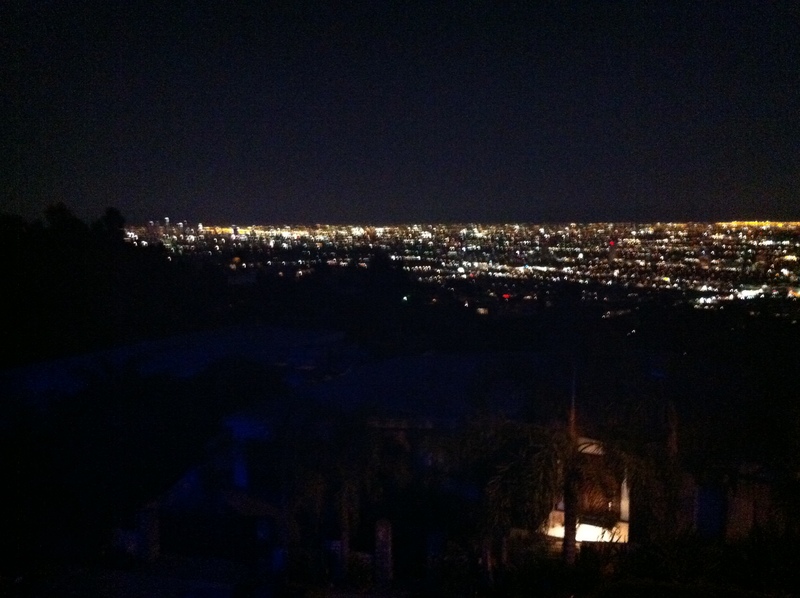 Was invited to an evening at a Mansion up on the hills in Yorba Linda. As I was getting off the 91 I happened to look up and saw a blue glow on the top of the hill and wondered if that was where I was going, sure enough. 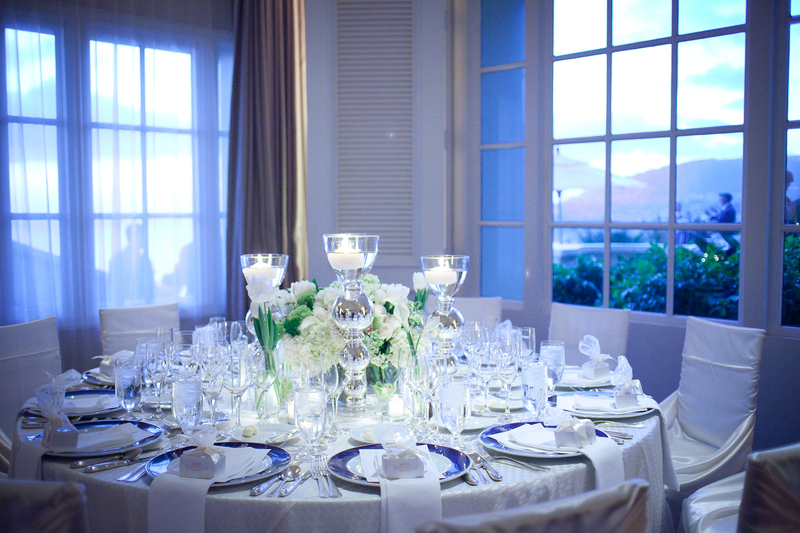 Right on the peak, surrounded by huge homes/mega homes, this massive white mansion with a huge glass enclosed pool, an upper ballroom area with a stage, tennis courts and grounds all around that can be used for everything, ceremony thru cocktails to dinner/dancing with views to the ocean that were pretty stunning. I happened to be in that area again last week during the day and looked up, no blue light as it was daytime, but that house is very hard to miss once you have been there, seen it or know where to look. Amazing. 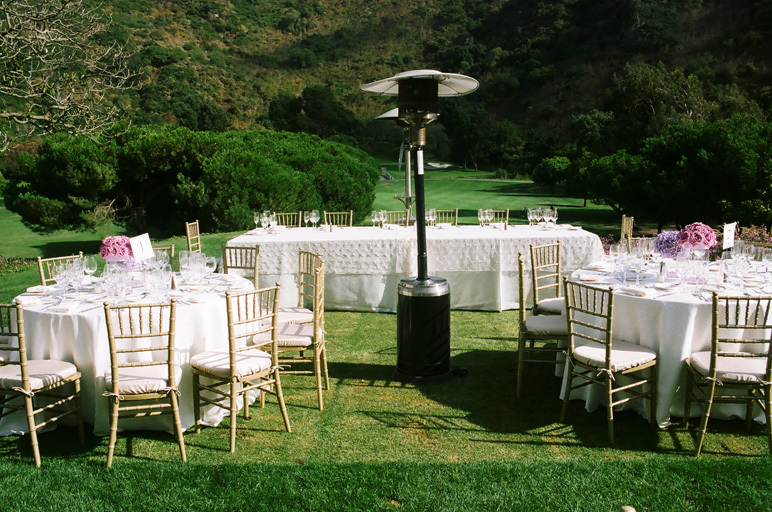 Arroyo Trabuco Golf Club & Talega Golf Club, seems to always be a couple of events a year at these properties, very calm, both offer different feel/style of events, very reasonable pricing!!! 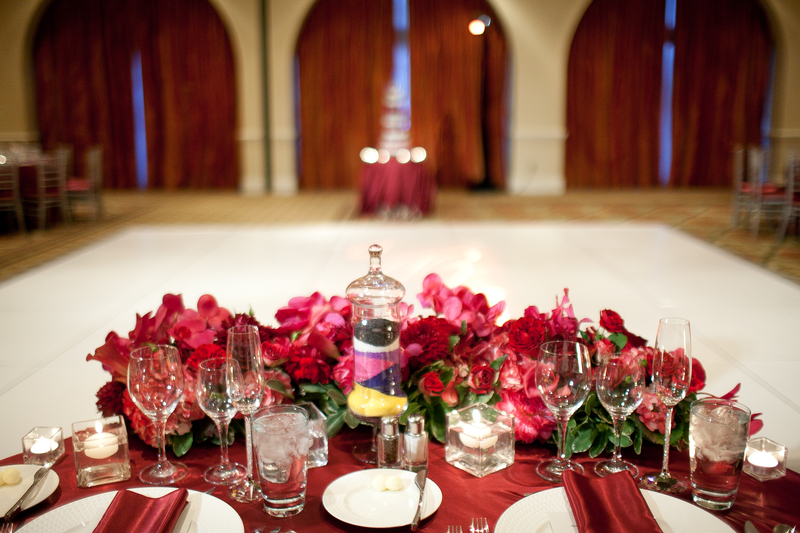 Wyndham Orange County – as happens with all/most hotels, the catering/wedding teams change. We are now with our 3rd lot of new people since I have been showing this hotel to couples as a potential for their budget & style, and doing weddings there. As this industry is small it is a team I know, and in order for this behind the OC performing arts center hotel to become known, needs this team under the leadership of Terri. It really is a gem of a hotel in a great location with a water view (may not be the ocean but it is water!!) and a nice modern/contemporary feel. A small group of us experienced the chef’s creativity at a lovely lunch, very impressive, the service was great also. Here you can do the cere ‘lake’ side, cocktails also, then move to an upstairs ballroom, very private and a good size for100-150 guests to have a ballroom feel but not feel like they are in a huge cave. Planet Hollywood – fun fun. What a great hotel, great rooms, just a cool vibe. 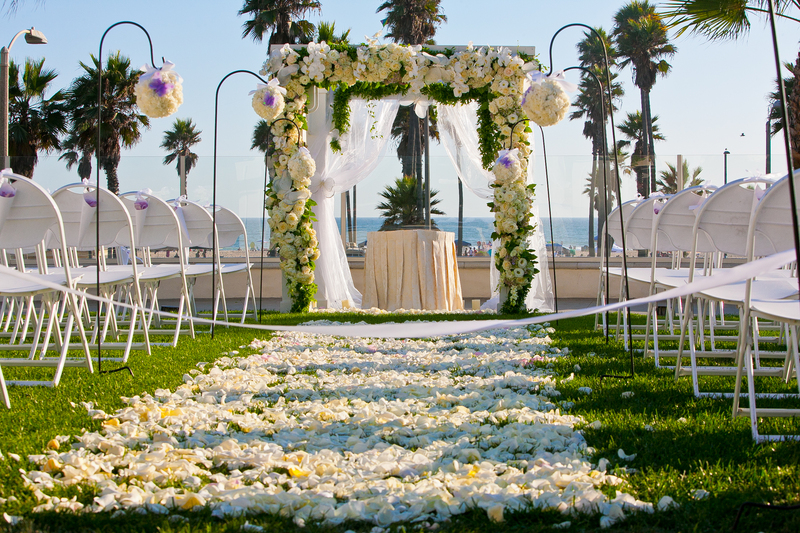 For your bachelorette party or even a quick honeymoon if you considered your S Ca destination wedding part honeymoon too, stop here on the way home for a whole different feel. Vegas is soooo great now for excellent restaurants, night clubs, shopping, shows, and of course, around the pool people watching!! Disney’s Grand Californian hotel, had a end of year dinner there last week. 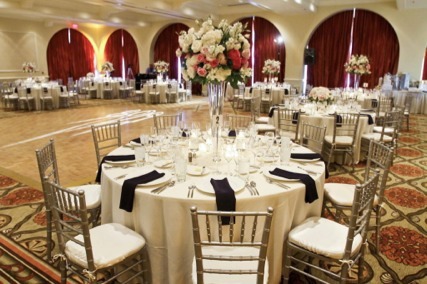 I was part of the thought process that went into the ceremony and ballroom areas of that hotel and when it opened had my wedding office with bridal salon right there in the hotel. I go back quite often, it doesn’t change, keeps to the plan, the different feel/atmosphere it offers to anyone in the area. 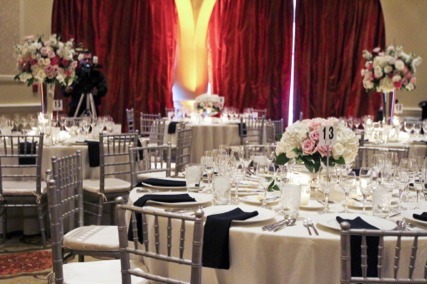 Anyway, this is the least Disney of the banquet rooms between the three hotels, excellent food, and funny to say, but after 11 years away, pretty much the same staff there both in banquets and in the wedding team, offering the service you expect from Disney. It’s like going/being home anytime I am with those lovely folks. Very comfy. A small group of us co-ordinators get together each month and experience some of the newer/older restaurants in the area that are great for rehearsal or pre/post wedding events, as well as hotels or locations that are a bit more boutique feeling. So too many of them to mention. Yes, the seasoned girls of the OC are all friends and share info on great vendors (and unfortunately sometimes, not so good, so we warn each other in order to protect our couples), things we have seen/learned etc. We are a great resource to each other and that in turn rubs off onto our brides. We each have different styles and personalities and offer different services, so very rarely do we get interviewed by the same couple, so there is no competition between us, we have come together due to our passion and love for what we do and our longevity/knowledge. 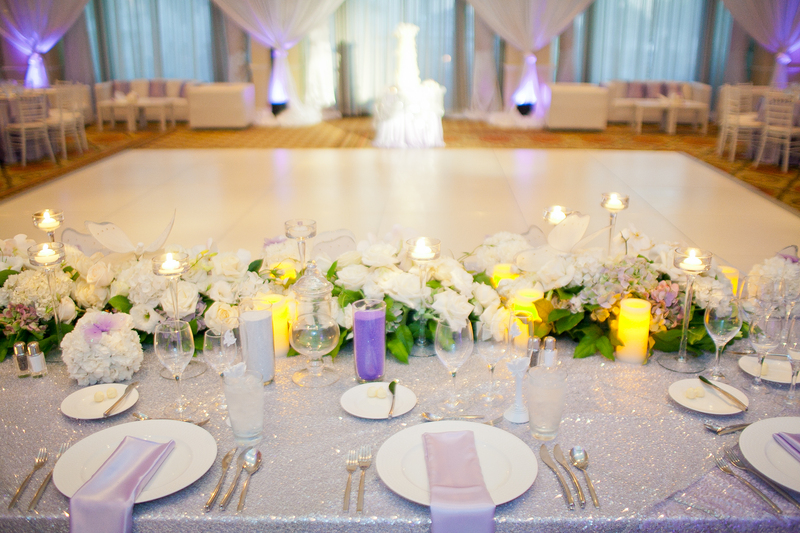 We have seen many vendors come and go, as well as co-ordinators!! One of our group is even a guy, so he is great to calm us down when we get a little bit too passionate over a certain situation that may have come up. And, there are places/events I went to, that I would not mention for various reasons, but none of them good. So good thing I do get out there or your time may have been wasted also, much better to be my time. I feel so happy, each time I pop into the office right now to meet with someone or just pick up the mail, there is another card or two from one of my lovely couples from this year or a past year, you make me smile everyone, thanks. 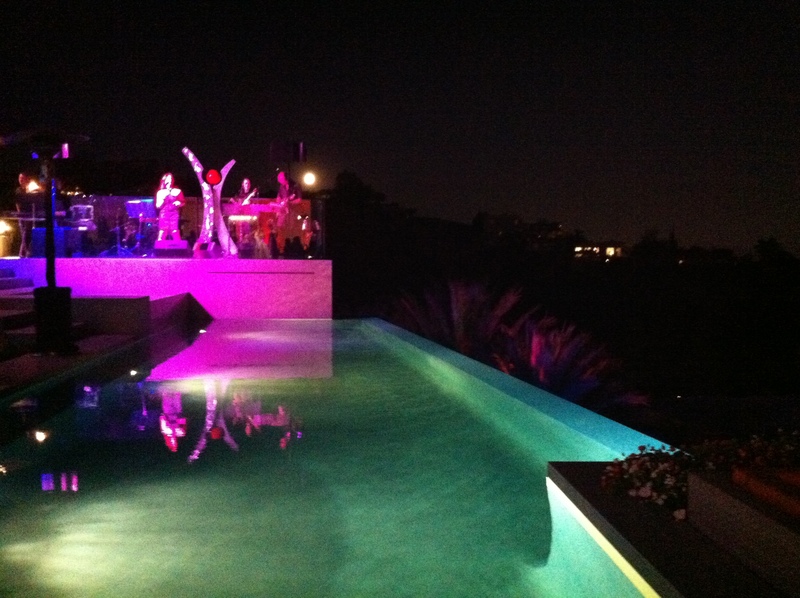 I feel so honored when I get to an event and realise it was only a select few who were invited, as was the case about a month ago, when I rolled up to the area of the address I had been sent, and then got on a shuttle and was taken to the front path of this very cool home on a cliff with the most awesome view of Los Angeles I have ever seen. Sunset happened off to the right and then the city became just a sea of glimmering lights for the next couple of hours that I was there. 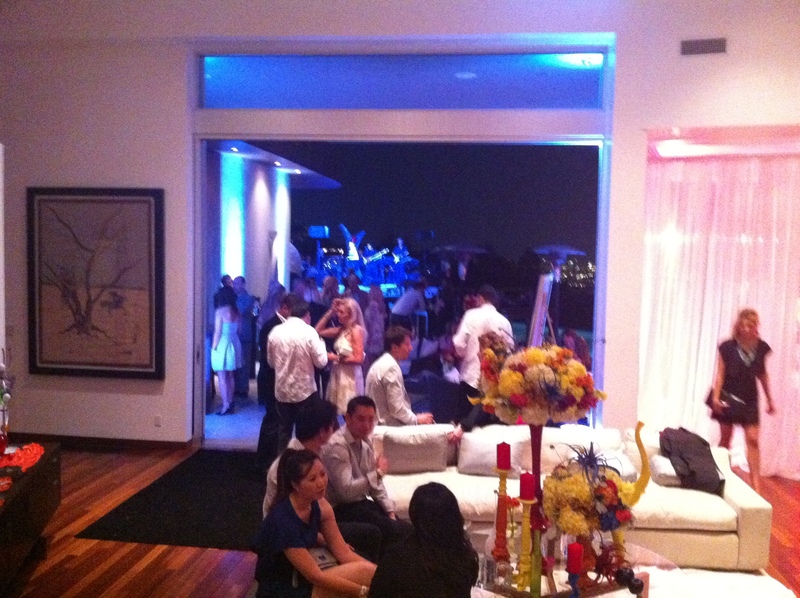 This is a home you can rent out and have a party or wedding celebration at. 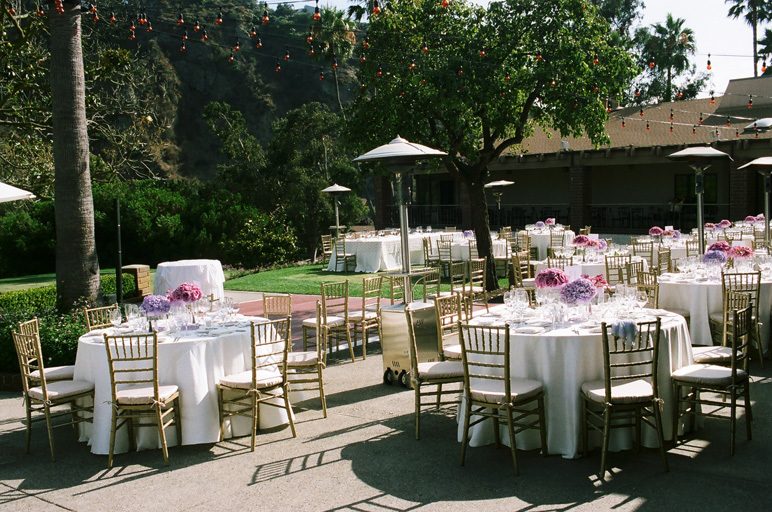 Not the traditional setup for a large ceremony/group, but for a church wedding followed by casual/social celebration (we had a band and food stations and it worked fabulously), or an intimate group of say 30-40 where you could have a ‘traditional’ ceremony setup with Los Angeles as your backdrop, then dine inside the house at properly setup banquet tables/chairs/linens etc, then back outside for dancing by the pool and socialising by the firepit, all the while looking out to the glimmering city of lights. Nice. Whether locals or coming to LA for a hip/fab celebration, something like this is for sure going to make an impact/create memories. The picture below is of one of the room inside this home and the view behind, the other big open room is right inside the front door and you enter and look across this lovely living room out to the open area with the pool/view beyond. Let me know if something like this is appealing to you, and I can help. I will caution you, most of the time a home that is lived in could be needing financial assistance/or be on the market (think about it, if you had the money why would you allow strangers to come into your home and enjoy it or push you out on a weekend etc), long term planning not normally a good idea, but a celebration that may be happening in the next couple of months should be safe. Thanks to hip/fab Lauren of Design Visage who happened to be at the event (they did the hair and makeup on some models that were walking around), for these photos. It’s always great to see her and the DV team and their leader Karen, they are so fun and make my brides look fabulous on their day/for the whole day!! !